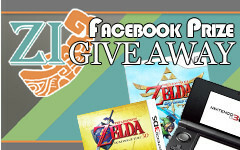 With all of the E3 hype going around, we thought it was a great time to give everyone a reminder about our 3DS and Ocarina of Time 3D giveaway. That’s right – you could win an awesome bundle with the console color of your choice and a copy of Ocarina of Time 3D – both in your regional version. What do you have to do for your chance to win? It’s simple, just “like us” on Facebook and keep your eye out for the “OFFICIAL ENTRY STATUS” which you will need to comment on to enter the random draw. More details inside.